After Benfica's draw against last-placed Arouca the night before, FC Porto had yet another reason to get a much-needed win against Braga, something Paulo Fonseca's team eventually did. There are always (at least) two ways to look at something. 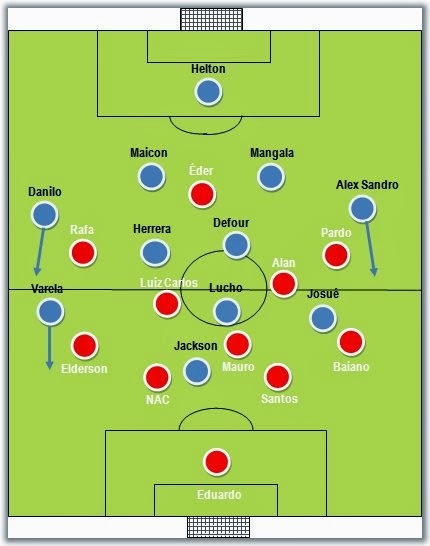 Case in point, the increasing difficulties both FC Porto and Benfica are having to get past opponents. On one hand, one could argue it's the big two that have been playing below par. On the other hand, one could say that the remaining teams are becoming stronger (at least domestically). The bottom line is that this season's Liga Zon Sagres has been getting more and more interesting, with Sporting playing dead and discreetly climbing their way back up the national ladder once more. Last night's match between FC Porto and Braga was hardly one of those matches to go down in history, but it was entertaining nonetheless. With a mere win over the past 6 matches, Paulo Fonseca was heard claiming the team were playing well and the only thing missing were goals, and surprisingly demanded "more attitude from his men", which hardly looked to be the issue at hand, since the most pressing problem seems to be the side's lack of ideas while attacking. For someone that has kept insisting over the past few weeks that he believes in his abilities and that he won't be changing his mind, Paulo Fonseca threw a half-surprise by shuffling the line-up once again, with Josué deployed on the wing (left for most of the match) and Defour and Herrera in the centre. Jesualdo Ferreira, in turn, stayed true to the XI he has been naming over the past weeks, with the exception of Ruben Micael. Alan was interestingly introduced to the middle of Braga's 4x3x3, with Pardo on the right. During the first half-hour, the match was everything that was expected - a trembling FC Porto and an expectant Braga. In fact, the initial 30 minutes might even be described as textbook Jesualdo Ferreira: A team calm and collected while defending and waiting for their opportunity on the break. Braga's goalkeeper Eduardo was hardly ever forced to blemish his white kit during that initial period, with the Dragons always looking vulnerable to any balls given away and unwilling to shift the ball around (often insisting on the direct, and often misplaced, pass). Braga were definitely throwing a spanner in FC Porto's works, but the home team were being their own worst enemy, as so often has been the case so far. 35 minutes into the match, Josué forced a huge save from Eduardo with a close-range shot. Despite FC Porto's lackadaisical efforts, Braga were now less and less able to play on the counter and the home supporters eventually found a way to get behind the team. Half-time came and went with not much to register. Paulo Fonseca decided to change things immediately and boldly replaced captain Lucho González with Carlos Eduardo. The time to assess said change was not enough, as the Dragons scored shortly afterwards through Jackson Martínez's deflected shot into Eduardo's top corner. The ill-concealed anxiety from home supporters finally had given way to long due celebrations and the team responded in kind, playing more fluidly and making Eduardo work a bit more. As for Braga, if the initial 30 minutes had been textbook Jesualdo Ferreira, what happened next was too - as so many FC Porto supporters will remember -, with a disturbing lack of attacking intent or a plan B, something that happened frequently during his time at FC Porto against bigger teams. Therefore, it was hardly surprising that FC Porto enjoyed the best chances during the second half, with Braga offering nothing but timid displays of intent to get a better result. In conclusion, while it may be tempting to have this pinned as the moment when FC Porto came back from the ashes, the team's display was still miles away from their dominant displays from last season (for instance) or the first two matches of the current season. It was undoubtedly a crucial win for Paulo Fonseca in particular, as the noose around his neck was getting tighter and tighter, but there is clearly still a lot of work to be done if the champions are to retain their title. Cue Sporting tomorrow.